KEF LS50 Wireless speakers aim to “improve on greatness” | What Hi-Fi? There’s now a powered, wireless pair of KEF’s five-star anniversary model, the LS50s. 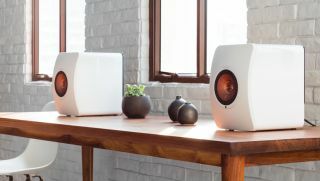 The new LS50 Wireless speakers are due on sale in November for £2000. KEF wants to bring the same sound of the original LS50 speakers (£799) to a wireless model, keeping the acoustics the same while adding the necessary elements for a pair of wireless speakers. So, the KEF Uni-Q 25mm aluminium-dome tweeter is here once again, positioned in the centre of a 13cm magnesium/aluminium low-frequency driver, and the baffle is the same design as found on the original passive LS50s. The cabinet is slightly deeper, with the electronics housed in this extra space. The speakers come in the form of a ‘master’ and ‘slave’ - fixed, for now, as the right and left speakers respectively - with all the action in the master and an ethernet connection to the slave speaker. As well as the larger cabinet, the master speaker has touch controls on the top and the inputs and outputs on the back. You can connect via ethernet, wi-fi, aptX Bluetooth 4.0, asynchronous USB or optical inputs, while there’s an analogue out for connecting a subwoofer. There’s an analogue audio input, too. Inside there are four DACs, one for each amplifier, with one amp for each driver. All the DACs operate at 192kHz/24-bit. The speakers also feature a new, KEF-designed, “time-correcting” DSP crossover. Amplification comes in the form of a 30W Class A/B amp for each tweeter and a 200W Class D amp for each mid/bass driver. There’s a mobile app for Android and iOS devices, which will guide you through the set-up process, give you access to a whole host of EQ settings and, of course, let you control your music. KEF is proud of its set-up and EQ options, which it hopes will reduce users’ concerns that the speakers won’t sound their best when they get them home. As a result, there are ‘desk’ and ‘wall’ modes, which adjust the sound according to your placement, as well as treble trim, bass extension and phase correction tweaking options. Beginner and expert modes mean it’s up to you how much you want to get involved. Also on the way is a KEF LS50 Wireless ‘ecosystem’ of products, in the form of the Chord C Stream ethernet cable and Custom Design LS50 stands (based on the Custom Design FS104 stands), which KEF says can help ensure customers can hear the speakers how they’re intended to sound. Unveiled at The Indulgence Show in London (which is open Friday to Sunday 16th October), the KEF LS50 Wireless speakers are due out in November, will be available in titanium grey/red, gloss black/blue, and gloss white/copper finishes, and come with a £2000 price tag.